Camangi WebStation Unboxed. Red Flags Go Up. I’m watching news on the Camangi Webstation carefully because personally, I’m not too positive about it and I’m interested to see if people fall for the looks without thinking about what’s in the core of this device. Having owned a SmartQ7 which is almost exactly the same device in terms of specifications, I am expecting slow performance from UI, web and video; which for a ‘WebStation’, is going to be a problem! The SmartQ7 was $200. The Camangi Webstation is near $400 which is an even bigger problem! More of our Camangi Webstation analysis can be found here. While my vote goes to the Wirelession W1060 (our review here) or even the Archos 5 IT because of it’s next-generation and far more powerful ARM platform I can see why people are excited about the Camangi Webstation. 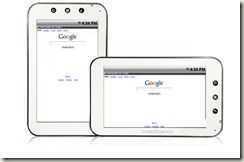 It looks good, is promoted as an Android device and has had some good airtime around the web. The W1060 is marketed as a WinCE device with a few basic looking images. Not the best marketing plan! The Wirelession is also getting an Android port but like the Camangi Webstation and Archos 5, it’s not the full Android that many people know and love which leaves core features like A/V and Web as the main apps until apps filter through from hacks and the built-in dedicated marketplace. A/V and Web are the two applications we’re looking closely at when we check out the reviews as they come in. For example, Laptopmag have immediately said in their first hands-on post that the Webstation ‘Feels sluggish.’ That doesn’t surprise me. Videos don’t seem to be playing smoothly, YouTube doesn’t work and it doesn’t look like web pages load quickly either. None of these problems are going to go away which cuts out any potential market for pro or even pro-sumer use. It will interest ebook fans, sofa surfers, travelers (with a folding USB keyboard), people looking for an emergency computing device, people looking for a cheap project device, a synergy companion, a kitchen recipe book, an off-line Wikipedia but not those looking to use web apps, play games, play high quality videos or use the device as a PIM. As with the SmartQ7 though, it’s a sign of things to come. It raises the bar in terms of style and if someone can get their act together and build a solid, authorized and supported version of Google Android on these devices then everything will move a big step forward. If everyone scrambles to build their own incomplete Android OS though, there could be a lot of disappointment. Gear Diary has a nice unboxing below. 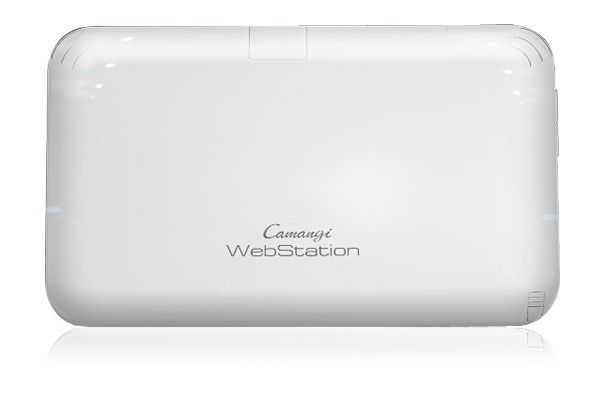 Camangi Webstation Now Available to Order. As promised, odering is now open for the Camangi Webstation. If you’re in the U.S., Japan or Taiwan you can order through PayPal and get free delivery for $399. As we said before in our analysis article,this appears to be coming in slightly under-specified for a $399 price. 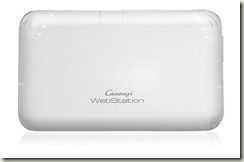 Devices Comments Off on Camangi Webstation Now Available to Order. Camangi Webstation 7″ Android Pad. Analysis, New Pics, Specs. News about the Camangi Webstation has been around for a while and it’s been interesting to watch the company ramp up their marketing from a fuzzy introduction in October to a smart-looking website today. The product looks quite slick too but is it going to work? I have a few reservations and am suspicious that this the Webstations is more marketing than product. 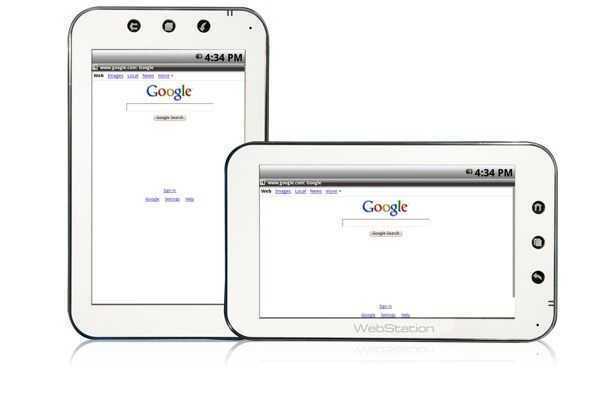 We’ve seen 7 inch resistive touchscreen devices many times before. The Samsung Q1 Ultra was a good example. The current Viliv X70 too but these were using (by necessity) a Windows desktop environment. They work well for people wanting a full mobile desktop experience with full driver support, high-end browser and desktop application capability but for the casual consumer of web and media, they are a bit OTT. The user interface isn’t fun and battery life issues mean you have to keep them turned off if you want to preserve battery life. They just aren’t set-up for the average internet snacker. The Camangi Webstation appears to offer a much more consumer-focused solution. The weight, price, style and operating system are all tuned towards coffee-table, sofa and casual, mainly home or holiday-based, internet activities. Full gallery at UMPCPortal Also at Camangi website. 390grams is a good one-handed weight (anything over 500gm can feel awkward after 20 minutes) and the price, which is rumored to be $399, is far more palatable than the $600-$800 that you pay for a Windows-based ultra mobile PC but it’s the Android operating system that really tilts the device towards the consumer. It’s touchscreen-friendly, tailored towards the casual user rather than the productive professional and is infinitely customizable with icons, widgets and applications. So how is this baby going to perform? The speed of the browser, quality of media playback, ability for applications to run concurrently and the battery life are going to be critical. Taking a look at the battery specifications and using a lot of experience I’ve had with testing devices (and interpreting marketing figures) tells me that we’re looking at a device that will allow you to browse the web for under 4 hours over Wifi. 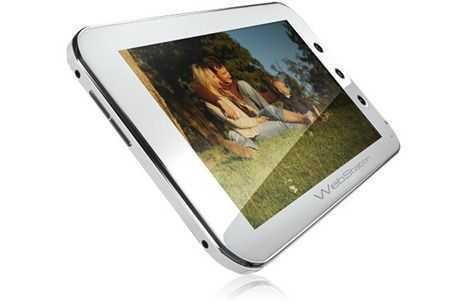 The large screen backlight will be taking a lot of juice and web-sites can be very heavy-weight CPU consumers. The nice thing about using a low-power ARM platform is that if you close all the apps, the device will sit around for a day or two and be ready to jump into action within seconds. Screen-off activities like music playback will also run into the 10+ hours range making it a nice addition for the home hifi. As far as performance goes, this is where I have my reservations. The CPU in this device is not exactly leading-edge and with about 1/2 the processing power of top-end smartphones (estimated 1/5th of the processing power of a netbook) , browsing speeds could be somewhat laggy. Media playback performance could be limited too. Granted, the need for speed isn’t as great when you’re lying back in a comfy chair but in my opinion, the performance isn’t going to match the marketing that we’re seeing and there could be disappointment. I’ve tested a very similar device, the SmartQ7, and I can’t honestly say that it was a thrilling experience. Regardless of operating system if YouTube doesn’t work or programs hang for too long, it’s frustrating. You can find more information and marketing materials on the Camangi website. Camangi are moving in the right direction. The style, choice of operating system and pricing are positive points but I’m a little worried that the limited CPU, RAM and the resistive touchscreen will disappoint customers. Upgrade to the latest CPU platform and drop 256MB of RAM in there and it would stand a better chance. Camangi also need to watch their competitors too. 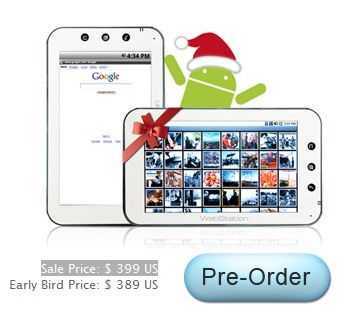 A 5 inch Archos 5 with Android with an 800Mhz ARM Cortex CPU (the latest and greatest) already provides a smooth experience at a lower price and if you’re looking for a 7 inch device, the Wirelession W1060 offers a similar high-end performance at just $250. We’re going to hold off from putting this into the database until we can confirm that it’s not just a pretty face.